Inside the box : quail eggs, cheese sausages, flower shaped carrots, baby corns sauteed with finely chopped parsley, and mango chicken. Wow..cute little girls...I love them so much. You are so GOOD in decorating the bento & the rice balls. I really love the girls so muct, they are so adorable & pretty. Love the way you decorated the girls' head & the eggs too. Lovely!!! Love it!!! I especially love the polka dotted quail's eggs - how did you do that? And mango chicken sounds delicious..yumms. This is cute too. Love those eggs..how did you do that? Girls are so pretty and those dotted quail eggs are cool! Lia, I'm just in awe and dumbfounded!! The details are just amazing. Love everything. @susanyuen : You will always be my bento guru. Glad to read your kind comment that give me so much encouragement :) Thanks a lot Susan! @Sonoma Bento : Thanks a lot SB! Please try it too ... What I love from our bento world is that we can always share as I always get inspired by all of you :) Your works on quail egg are awesome that perhaps I will borrow your idea too. 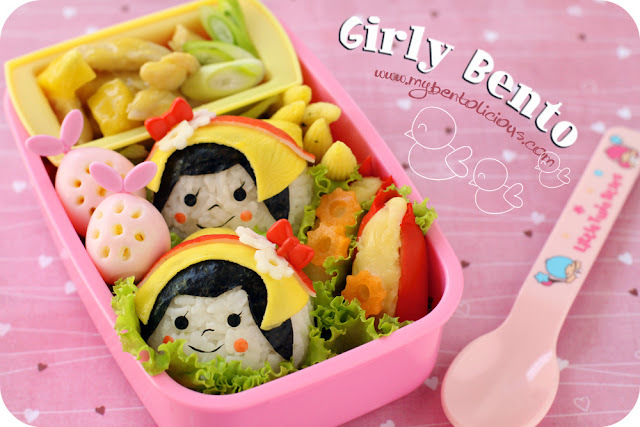 Lovely bento Lia! So pinkish!!!! We love mangoes too but funily, this year mangoes are so far lesser than last year. OMG, this bento is soooo lovely, the two girls and the quail eggs. Wonder how long the bento took you? Great work, Lia!! @prince n princess mum : Thanks a lot for your nice comment! @Margot : Thanks a lot Margot!